Update 7/25/2012: Elements has closed. My neighbor S. and I went to Elements Contemporary Cuisine at the Gateway Center in downtown Pittsburgh for dinner one night earlier this month. From the outside, one might think that Elements is a casual lunch hotspot catering to the working crowd (well, the $5 pizza signs out front are a bit deceiving), but it is actually pretty upscale on the inside. We were seated at one of the tables by the window overlooking the patio, which was very nice. The atmosphere is great. Elements' menu is interesting. If there were a prize for "The Toughest Menu to Choose From," Elements would definitely win top honors because there were so many delicious-sounding choices and it took me a really long time to settle on a decision. Aside from various seafood, chicken, red meat, and pasta dishes that all sound amazing, the back side of the menu is devoted to cured meats, cheeses, and "more." I understand that meat curing is a specialty of former executive chef Justin Severino's, and I'm glad to see that Elements has continued to highlight charcuterie as part of their offerings after Chef Severinos' departure. 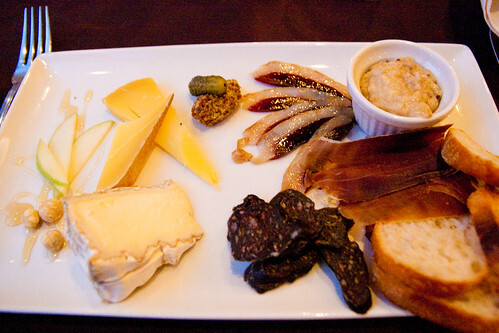 The six-item charcuterie plate doesn't look like much, but don't let it fool you. Both Neighbor S. and I were quite full by the time we finished our plates. Neighbor S. had also gotten one of the venison meats because she had never liked venison and wanted to see if she would like the cured version - and she did. We both enjoyed our meals. But despite being full, how could I resist dessert? Especially one called Tempura Chocolate Cherries? 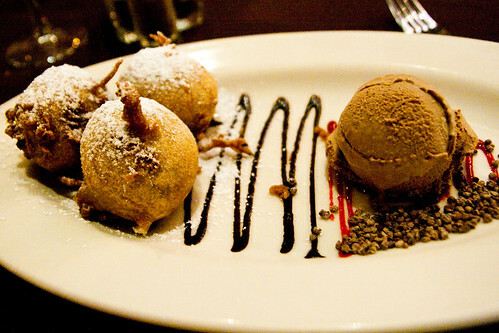 This decadent dessert consists of three deep fried balls filled with a super rich and soft chocolate and cherries, along with a scoop of chocolate bourbon ice cream. The tempura was sinfully delicious, and made me wish I hadn't already been so full from all the meats and cheeses. The ice cream was not bad as well. Both Neighbor S. and I found our meal to be highly satisfying. We found out as we were leaving that Elements offers validated parking at the building's garage - which is good to know for next time. Because there WILL be a next time.